The town of Hudson, Quebec, its places, people and businesses online. Send a personal message to Hudson and other Hudsonites. Your newly posted message will appear shortly. To look for a specific name or subject, use the search feature. Commercial or other inappropriate messages and messages not related to Hudson will not be posted. We can't answer questions about Hudson businesses or facilities. This one makes sence "One's first step in wisdom is to question everything - and one's last is to come to terms with everything." Drove through Hudson the other day and it sure has changed. Part of Habib's is a health food store and the other side seems to be a financial advisor. Apparently Philip Habib now runs a multi-million dollar printing business - I once bought a suit from his store and it was a good one too. Who remembers how the Habib twins used to gang up on people at Mount Pleasant. One would duck down behind you and the other one would push you over the top. This site brings back lots of memories. The opening of the commuter train station at Vaudreuil 3-years ago and service to and from every 15-minutes during rush hours has provided welcome relief to commuters. It has the potential to bring about new growth in the towns of Vaudrieul, Dorion, Les Cedres, Hudson and St Lazare. The town of Milton in Ontario is the fastest growing city in Canada. It is also a turnaround point for commuter trains to and from Toronto. Within the next few years the region around St Lazare will gain easy access around the south side of Montreal following the completion of the planned Hwy 530 across the St Lawrence River. That highway will merge into Hwy 30 that will connect Valleyfield to Montreal's South Shore as well as to Hwys 10, 15 and 20. The region of Quebec that is located immediately to the west of the Ottawa River will gain easier highway transportation access to Eastern Canada as well as to the Northwestern United States. That transportation access could attract new industry into the region and make the region more accessible to a large and qualified workforce who live in towns along Montreal's South Shore. Easy access to a large and qualified workforce is one of the main criterior that new industries use to decide where they will open. Easy commuter access by road and on the commuter trains could enhance future economic development in the region around St Lazare. The little airport at St Lazare has the potential of being developed into an aeroparc in the future. There are almost 100-aeroparc's in the United States and one is planned at Carp airport that is located to the west of Ottawa. An aeroparc is a premium residential area that is built on private land that surrounds and includes an airport. Aeroparc residents can taxi their aircraft from the main runway and part their aircraft in their own driveways. St Lazare could be an attractive location for an aeroparc that could become home to people who work in upper managerial corporate positions. There may be scope to extend one of the runways to 5000-feet (1600-metres) at St Lazare's privately owned airport. A runway of that length would allow for commuter jet and STOL commuter aircraft to provide scheduled service to Toronto Island airport and the airport at Quebec City. The combination of new commuter trains, new highway connections and an upgraded airport in the region could further enhance St Lazare as an especially attractive location in Quebec. Harry Valentine is a regular commentator on transportation, energy and social issues. Would you have someone who could help trace my Grandfather, mother and Farther. He was born June 3, 1870 in St. Lazare, Quecbec his name Marcelle J. Cote' and moved to Vermont when he was 21 and became a US citizen. He died April 15, 1848 in St. Johnsbury, Vermont. I have a software of my family Tree And need information before him. Any help would be appreciated. I hope you can help us. We are looking for a fellow that came to Canada in the 1870's from Ireland. His name was Montrose Hamilton Irwin, but could have been called Mount Irvine/Irwin. Some time, we do not know when, he went thought the ice on horseback and was drowned. Is there anyway we could check this out in or around Hudson, Quebec. We live in Saddlebrook & on Tues. when we went to our mailbox on St. Charles Rd., we could see that several mailboxes had been broken into & the mail was on the ground. Our mailbox wasn't open, but I was wondering whether some mail might have been stolen from in the "house". The next day we didn't get any mail, so maybe the mail was halted. What is the story about this, as I am concerned that some of our mail might be missing. I am trying to trace a lady who may be a descendent or relation of my Great Uncle Henry "Harry" Walter Morris, a Mrs Mary Laycock, a resident of Como. Sometime prior to 1914 Harry emigrated to Canada from his native county of Oxfordshire, Endland. He went onto join the Canadian Expeditionary Force in 1914 and returned to England before serving in France, where tragically along with a whole generation of young men he was killed in action in 1917. He had risen through the ranks to become a Leiutenant in the 75th Battalion, he was decorated with the Military Cross. He left a wife Elizabeth in Verdun, Montreal who he married just prior to leaving Canada, at this point the trail goes cold until the 1970's. From his service record we know that in April 1970 a Mrs Mary Laycock of Station Road, Como, P.Q. was sent a "Statement of Service in the Canadian Armed Forces" by the Dept for Veterans Affairs and in 1976 a similar leter was sent to a lady in Monterey Drive, Ottawa. If anyone knows of Mrs Mary Laycock or her family, could I ask that they pass my contact details onto them so as they can get in touch with me if they wish to. Thank you very much for your assistance with this. Anyone doing 3-dimension pictures. My wife was in it but she passed away last summer. If someone is doing 3-D I have frames, partial completed pctures, pictures, etc. I.d like to get rid of. Just leave a message on the website. 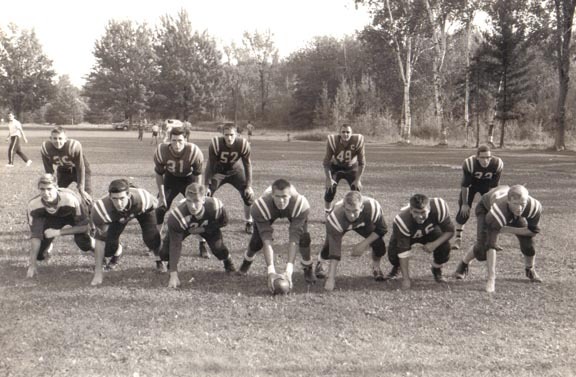 The Hudson High offensive team in 1961. From left to right the players are: Backfield: Ted Bowser, Jim Florence, Dave Bradshaw, Harold "Doc" Benson, Steve Davyd. Line: Mike Lagimodiere, Charlie Hodgson, David Daoust, Don Smardon, Pat Rolfe, Ron Bonspiel, John Wright. Photo courtesy Steve Davyd.